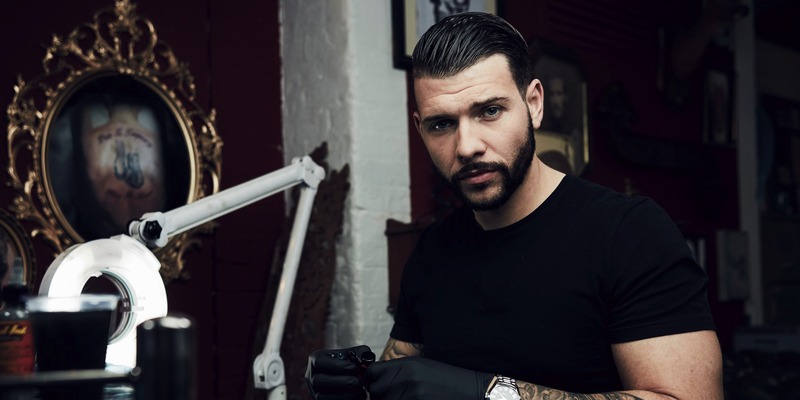 Now 25, Jay has been tattooing since he was 18, and currently manages his own Cheshire studio. He’s always had a passion for drawing and after his first visit to a studio he decided that tattooing was the career for him. A week later he took his portfolio to the manager and was immediately hired as an apprentice. When Jay decided to open his own studio three years ago he made it a family affair and took on his brother as a trainee. Together they now have a waiting list of over six months. Jay’s work has appeared numerous times in the international press, most notably when a tattoo of Mike Tyson he inked on his brother received attention from the legendary boxer himself. Tyson publicly applauded the tattoo and the pair later met at a sports dinner when Tyson was able to see the tattoo in the flesh; he has since featured Jay on his official website. Unbelievably, the same situation occurred with world champion Floyd Mayweather. Since then, Jay has inked an array of celebs, such as Kerry Katona, and a wealth of Coronation Street stars and American rappers – including Travie McCoy – have expressed a desire to work with him. For Jay, the best part of his job is ‘the crazy variety of people that you get to meet every day’. Jay’s favourite style is realism, and although he could do portraits ‘all day every day’, his main priority is making sure that his clients are 100% happy with their design. Jay does a lot of cover-ups now, and although he loves the challenge and has done some of his favourite pieces as covers, he does wish that people would think before they ink!